One of the things I love most about recipes is the fact that, when you find one you love, you share it. 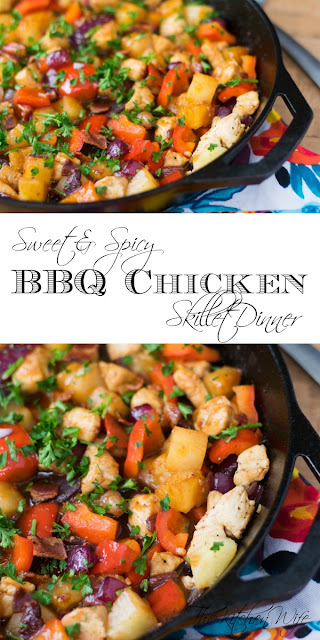 That is where today's Sweet & Spicy BBQ Chicken Skillet Dinner Recipe came from! This Sweet & Spicy BBQ Recipe only takes a few simple ingredients. To begin you will place the bacon into a COLD pan and turn the heat on to HIGH. This will not only help the bacon to get nice and crisp, but it will also render that glorious bacon fat to cook the rest of the meal in. OH YEAH! Cook until the bacon is crisp and fully cooked, about 10 minutes. Once the bacon has finished cooking remove it from the pan and place it to the side on a paper towel. Now add the onion to the pan with the bacon fat and cook for 2 minutes until soft and translucent. To the onions add the chicken, garlic, ground ginger, pinch of cayenne, salt, and pepper. Stir everything and cook for 5 minutes. While the chicken is cooking you can combine the bbq and soy sauce. After 5 minutes add the red bell pepper and pineapple to the pan. Stir together and cook for another 5 minutes. After 5 minutes return the chopped bacon to the pan along with the bbq sauce mixture. Give everything a stir until everything is coated in the luscious sauce. And there you have it a beautiful chicken dinner, made in one-pot, in about 20 minutes! Does it really get any better than that? I don't think so. The savoriness of the chicken combine with the saltiness of the bacon blended with the sweetness of the pineapple is EVERYTHING! I served this over a bed of rice and I'm not ashamed to tell you I went back for seconds! 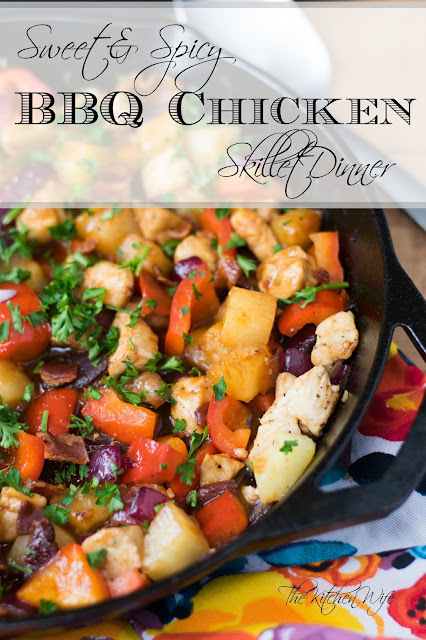 I will tell you this, I feel like this recipe with shrimp instead of chicken would have been a total game changer! 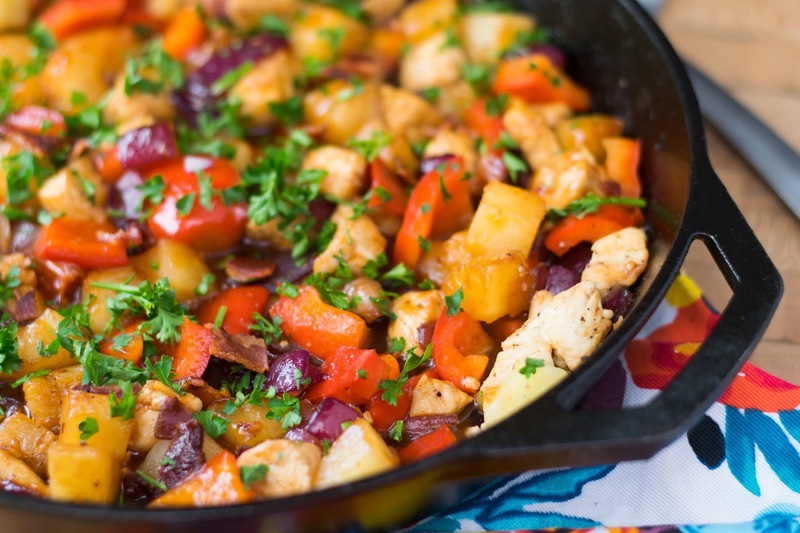 Either way you decide to make it this Sweet & Spicy BBQ Chicken Skillet Dinner is going to become a family favorite in NO TIME, so get in the kitchen and give it a try TONIGHT! Place the bacon into a COLD pan and turn the heat to HIGH. Cook until the bacon is crisp and fully cooked, about 10 minutes. Remove the bacon from the pan and place to the side on a paper towel. Add the red onion to the pan and cook for 2 minutes. Add the chicken (or shrimp), ground ginger, cayenne, garlic, salt and pepper to the pan and cook for 5 minutes. Add the red bell pepper and pineapple to the pan. Stir everything together and cook 5 more minutes. Add the BBQ sauce mixture to the plan along with the bacon and stir until everything is coated in the sauce.